Cartoon Shark Stress Ball is a great fun diversion.He is ready for action. 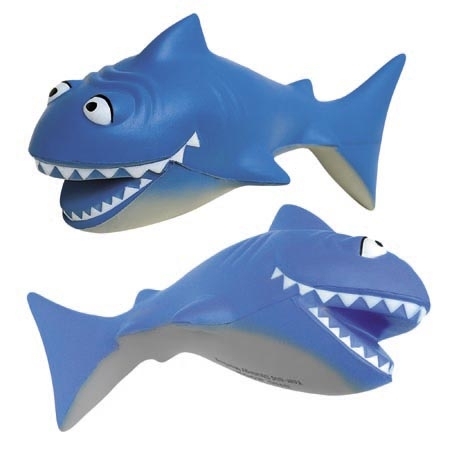 The promotional shark stress ball is made of squeezable polyurethane foam. They are presented to employees and clients as promotional gifts. Stress balls or stress relievers are becoming a trendy giveaway item. Because of the many shapes now available, stress balls are generically known as stress relievers. These stress relievers are an extremely affordable way to promote your business. Our Stress Relievers are all made by hand; no two balls are exactly the same. It is impossible to guarantee a consistent, uniform imprint. Broad imprint areas are subject to breaking up, and the imprint may not be solid. 6-1/2" x 2-1/2" x 2-1/2"
Bulk / 26 lbs / 200 pcs. / 24 x 14 x 15box.